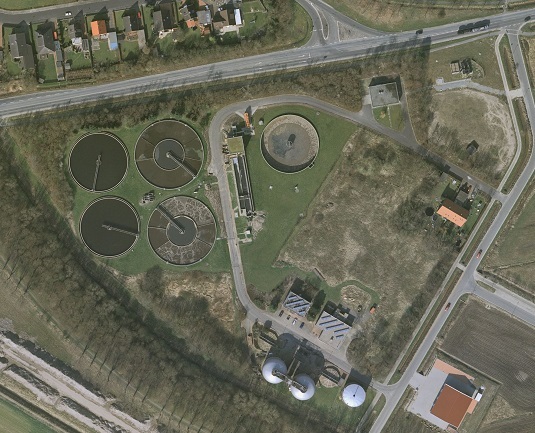 The main wastewater treatment plant of Emden in its current form was commissioned in 1983. The plant, which is aerobically stabilised and fed by a separate sewer system is designed for a population equivalent (PE) of 90,000 and charged with a PE of about 75,000. The plant treats the wastewater from the entire urban area of Emden which approximates a daily wastewater load of 11,000 m³ in dry weather. The combined primary and aeration treatment cell units are fed in parallel. The wastewater flows through the two centrally placed, round primary treatment cells (2 x 1,250 m³) and subsequently through five cascaded zones in the aeration’s exterior ring (2 x 4,630m³). Thereby basically two nitrification cells and two denitrification cells per aeration unit alternate. The nitrification zones are aerated by fine-bubble compressed air aeration. The cleaned wastewater, after separating it from the sludge in two clarifiers, is fed into the Ems. Since Aqualogic® has been installed it has been possible to keep the effluent values steady and within the defined limits. The construction and waste management facility of the city of Emden was strongly impressed by the overall results. For the enhancement of the wastewater treatment plant of Emden and the adjustment of the aeration capacity, which is planned in 2008, Aqseptence Group will be present as a reliable partner once again. Nothing stands in the way of a new assignment for an Aqualogic® upgrade, an additional Aqualogic® module for the control of return sludge and further sensors. The installation of Aqualogic® on the wastewater treatment plant of Emden can be described as a sustained success economically as well as ecologically.